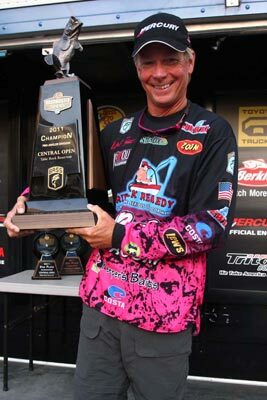 Kevin Short shows off his hardware for winning the Bassmaster Central Division season finale. Kevin Short kept plugging away each day and saved his best performance for last to win the season finale Bass Pro Shops Bassmaster Central Open at Table Rock Lake. The tournament featured about every challenge imaginable - a major cold front followed by bluebird skies, a slick water surface, dropping lake level, dropping water temperatures, fog delay, turnover and suspending baitfish. "I have not fished Table Rock a whole lot, but I have been fortunate enough to fish it when it was really, really good," said Short. "When I had a bag like that (15-7), people didn't even want to talk to me. I have also fished it when it was worse than this. There are some of those days when you just absolutely figure it out about what you need to be doing and you are in the right place and you just get it done. Today was one of those days." Short figured out that he needed to keep cranking his WEC E-1 crankbait in a "Classic" hue. In practice he figured the tournament would be won fishing deep. "The first day of the tournament I caught those three fish and they were all over the place. I had absolutely no confidence in anything. The second day I went all the way back in Long Creek, and for the last two days I have hit every single piece of wood (mostly laydowns) cranking. "The key for me yesterday was figuring out that the better fish were in there and I caught them on my little E-1. That gave me the confidence to go in there and stay all day today. I knew that I needed 14 to 15 pounds to even have a shot at winning." Short's best shot helped him claim the top prize of a Skeeter bass boat/Yamaha outboard rig valued at $45,000 and $9,000 in cash.